A tremendous entry of top quality Fermanagh and Tyrone breed cattle on offer at Thursday’s cattle sales with buyers present from all the province. Light weight bullocks selling from 210 to 253ppk for a Charolais 340kg at £860, medium weights selling from 202-240ppk for a Charolais 416kg at £1,000, heavy lots selling from 185 to 232ppk for a Charolais 518kg at £1,250 and selling up to at £1,420 per head. 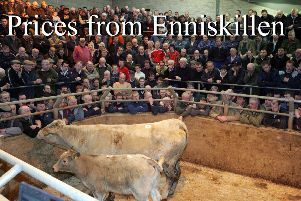 Enniskillen producer Charolais 340kg at £860, Charolais 360kg at £860, Belleek producer Charolais 416kg at £1,000, Garrison producr Charolais 430kg at £1,005, Omagh producer Charolais 484kg at £1,125, Charolais 466kg at £1,080, Brookeborough producer Charolais 518kg at £1,205, Charolais 518kg at £1,180, Trillick producer Charolais 540kg at £1205, Charolais 528kg at £1,175, Lisnaskea producer Charolais 542kg at £1,195 and Kesh producer Charolais 506kg at £1,110. In the weanling ring steers and bulls sold from £700 to £1,040 paid for a 385kg Charolais while heifers ranged from £550 to £920 for a 418kg Charolais. Enniskillen producer 343kg Charolais heifer at £805, 224kg Charolais heifer at £505, 356kg Charolais steer at £890, 418kg Charolais heifer at £920, 327kg Limousin bull at £800, 283kg Blonde d’Aquitaine bull at £745, Garrison producer 237kg Limousin heifer at £710, 237kg Limousin heifer at £590, 302kg Charolais heifer at £735, 304kg Limousin bull at £790, 445kg Charolais bull at £1,000, Kesh producer 436kg Limousin bull at £905, 415kg Charolais bull at £915, Belleek producer 360kg Charolais heifer at £785, 308kg Charolais heifer at £735, 428kg Charolais bull at £850, 253kg Charolais heifer at £680, 345kg Charolais steer at £860, Florencecourt producer 310kg Charolais heifer at £750, 350kg Charolais steer at £905, 360kg Charolais steer at £895, Derrygonnelly producer 445kg Charolais steer at £895, 410kg Limousin steer at £960, 362kg Charolais bull at £835, 410kg Charolais bull at £880, Bellanaleck producer 325kg Limousin bull at £810, 340kg Limousin bull at £840, 380kg Limousin bull at £885, Lisnaskea producer 297kg Charolais steer at £805, 324kg Charolais steer at £910, 313kg Charolais steer at £835, 309kg Charolais steer at £830 313kg Charolais steer at £855, Ballinamallard producer 322kg Charolais steer at £870, 327kg Charolais steer at £860, 217kg Charolais heifer at £550 and Enniskillen producer 235kg Charolais heifer at £685, 335kg Charolais bull at £830, 309kg Charolais bull at £845. Springfield producer Aberdeen Angus bull at £340, Limousin bull at £265, Derrylin producer Hereford bull at £300, Belgian Blue bull at £280, Tamlaght producer Belgian Blue heifer at £290, Belgian Blue bull at £275, Monea producer Belgian Blue heifer at £280, Irvinestown producer Aberdeen Angus bull at £275, Friesian bull at £95, Ballinamallard producer Belgian Blue bull at £275, Drumcose producer Hereford bull at £275, Lisbellaw producer Friesian bull at £120, Derrygonnelly producer Friesian bull at £95 and Garvey producer Friesian bull at £115. Belcoo producer Simmental cow with heifer at £1,450, Kesh producer Limousin cow with bull at £1,360, Omagh producer Simmental cow with bull at £1,350 and Lisnaskea producer Hereford cow with bull at £1,100. Forward lots sold to 217ppk paid for a 640kg Charolais at £1390 and a top of at £1400, medium and light weights sold from 192-225ppk paid for a 470kg Charolais at £1,060. Lisnaskea producer Charolais 675kg at £1,400, Charolais 640kg at £1,390, Charolais 640kg at £1,330, Charolais 610kg at £1,310, Charolais 620kg at £1,290, Charolais 650kg at £1,335, Charolais 650kg at £1,330, Trillick producer Charolais 600kg at £1,240, Newtownbutler producer Charolais 550kg at £1,140, Charolais 520kg at £1,085, Rosslea producer Charolais 530kg at £1,130, Charolais 475kg at £1,045, Charolais 420kg at £935, Derrygoonnelly producer Charolais 500kg at £1,060, Garrison producer Charolais 470kg at £1,000, Charolais 400kg at £920, Charolais 420kg at £935, Charolais 420kg at £860 and Derrylin producer Charolais 410kg at £925, Charolais 420kg at £900. Forward lots sold to 185ppk paid for a 590kg Charolais at £1,090 while lighter lots sold from 100-190ppk paid for a 400kg Charolais at £760. Culkey producer Charolais 590kg at £1,090, Derrylin producer Charolais 700kg at £1,060, Charolais 700kg at £1,000 and Roscor producer Charolais 700kg at £1,050.